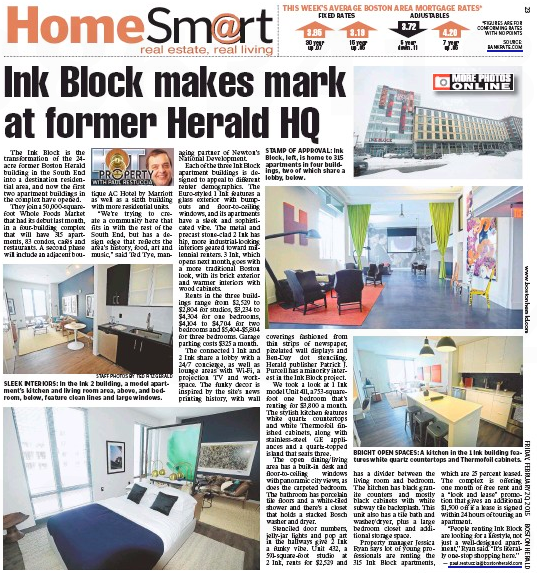 Boston Herald publisher Pat Purcell is a minority investor in National Development’s $200 million Ink Block project on the South End site that was home to the Herald for 53 years. As the hardreading staff has noted, the selfie local tabloid relentlessly heralded last month’s opening of a new Whole Foods market on the site, which will also include luxury condos and apartments, retail shops and restaurants. One of those pieces disclosed Purcell’s financial stake in the development, but we’re not sure the others did (we tried to check, but they’re archived at $3.95 a pop). Regardless, now comes yesterday’s full-page pitch (in article form) for the next Ink Block phase – two apartment complexes. Rents in the three buildings range from $2,529 to $2,804 for studios, $3,234 to $4,304 for one bedrooms, $4,104 to $4,704 for two bedrooms and $5,404-$5,804 for three bedrooms. Garage parking costs $325 a month. Disclosure of Purcell’s financial interest in the project is conveniently buried in the middle of the piece. The selfie local tabloid seems determined to run a Whole Foods/Herald story as often as possible. It started with this piece last Wednesday. 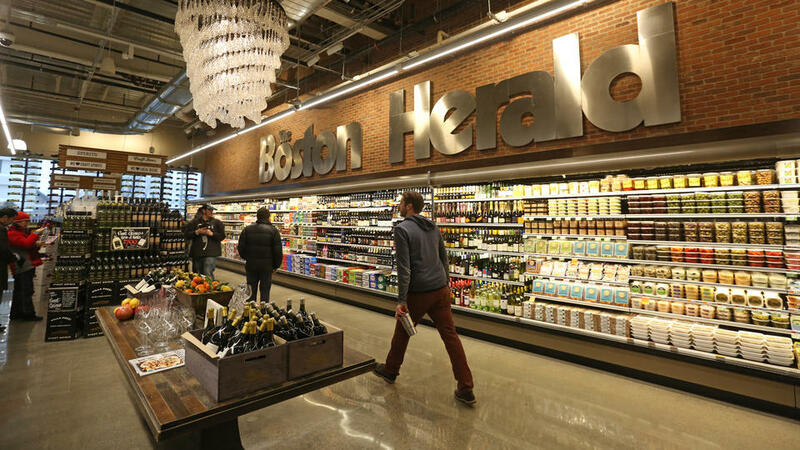 In the South End landmark where ink once flowed and the Boston Herald’s presses roared, shoppers will now enjoy frangipane tarts, cooked-to-order ramen and a milk + honey spa at Boston’s newest and most innovative Whole Foods. 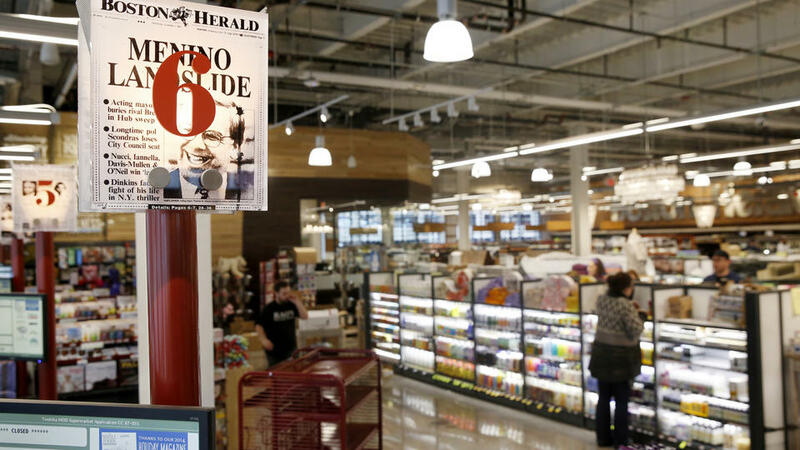 The 50,000-square-foot gourmet supermarket is part of National Development’s Ink Block project on the site that was home to the Herald for 53 years. 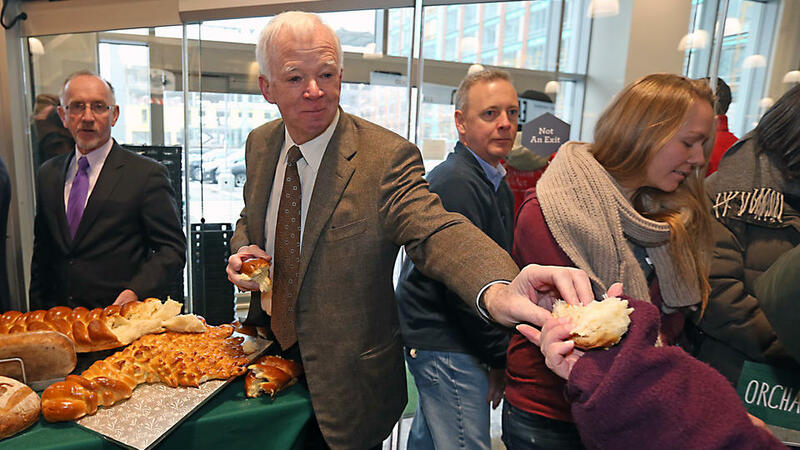 Whole Foods Market debuted its newest Boston store in the South End Friday — its second largest in the region and considered a flagship for its North Atlantic division — and co-CEO Walter Robb sees room in the Hub for another of its size. “We’ve seen the city evolving, so we have lots of plans,” the Boston native said. “The opportunity to come in here and get 50,000 square feet — that’s hard to do these days, and I do think there’s another one (in the future pipeline).” . . .
Its South End supermarket is in National Development’s $200 million Ink Block project, the former Boston Herald headquarters site for more than half a century, and it memorializes the newspaper’s history throughout its decor. I’m here to say you can. But when you do, you’ll discover home has been transformed into the biggest Whole Foods store in Boston. It’s a sweet trip down Memory Lane with Bert McNeil and Mike Bello, Danny and Dennis Messing, and especially Gelzinis himself. So – a Whole lotta money involved. But we don’t expect that to last long. The selfie local tabloid has a good one in today’s edition. And a sweet deal for Herald publisher Pat Purcell, “a minority investor in the $200 million Ink Block project, which also will include luxury condos and apartments, retail shops and restaurants.” Not to mention (and the Herald piece doesn’t) that the land itself belonged – belongs? – to Purcell. That’s a lot of frangipane tarts, yeah?